…but if airports started charging fees simply for motorists to have access to drop off or pick up a passenger at a terminal, the purported results would be increased revenue for the airport; reduced traffic congestion by encouraging more people to use high occupancy vehicles and public transportation; improved air quality — and drivers eventually absorbing the extra costs into their budgets, eventually nonchalantly treating the fee as just another toll or tax and simply factor it into the cost of travel. Not everyone is convinced of those results, however. One such person is reportedly Thomas Glynn, who is the chief executive officer of the Massachusetts Port Authority — which is more popularly and commonly known as Massport. Greater than 20 percent of the drivers of the approximately 108,000 vehicles entering the airport are dropping off a friend or family member — but if they all had to pay for the privilege of doing so, the number of those trips could be reduced, according to The Conservation Law Foundation. The addition of those parking spaces is expected to cost approximately $250 million under the condition that other measures to reduce auto emissions at the airport are considered and researched. The study by Massport is expected to be completed sometime by July 2019. Not only has traffic congestion increased exponentially over the years; but the air quality — and the quality of life in general — for residents who live in communities which surround the airport has been compromised. Another study by Massport will research the effectiveness of variable-rate pricing at the busy airport. Tolls Considered as Airport Fees? …that is, if traffic is not clogging them. I have used all three tunnels numerous times — and I can understand why many people seem to think that the tolls for the tunnels is already considered as fees to access the airport. At $1.55 each way, the Tobin Bridge is a less expensive option; but my experience has been that it is less convenient for access to and from Logan International Airport. …especially if you rent a car to access Logan International Airport — or any other place in the world where electronic tolling systems are in use. Logan International Airport would not be the first airport in the United States to charge a fee to motorists to enter the airport. Using TollTag, motorists are charged a minimum of two dollars to drive into Dallas-Fort Worth International Airport if they stay between eight minutes and 30 minutes — which is the typical amount of time needed to pick up or drop off a passenger. Fewer than eight minutes increases the charge to four dollars as a “penalty” of sorts on the assumption that drivers are using International Parkway to cut north or south through the airport to save time. Fees have been in effect at that airport since it opened four decades ago. A similar system of charging motorists for merely accessing the airport is already in effect in some airports in other countries around the world. Fees at greater than a dozen airports in the United Kingdom can range from $1.30 to five dollars, which some people believe is too low of a cost to deter more motorists from accessing the airports and think that $15.00 may realistically be a more effective fee to charge to change the behavior of motorist. How many times have we heard over the years about how travelers — such as you and I — will simply factor in yet another nominal fee as part of the increased cost in traveling? Not only do we already pay a plethora of taxes and fees for air travel, lodging and renting cars — including such ludicrous fees as mandatory resort fees and carrier-imposed fees, which are both designed primarily to purposely deceive the customer into an advertised price which is lower than what will be the actual total cost — but those taxes and fees have a tendency to keep increasing as though travelers are treated like some unlimited trough of income. 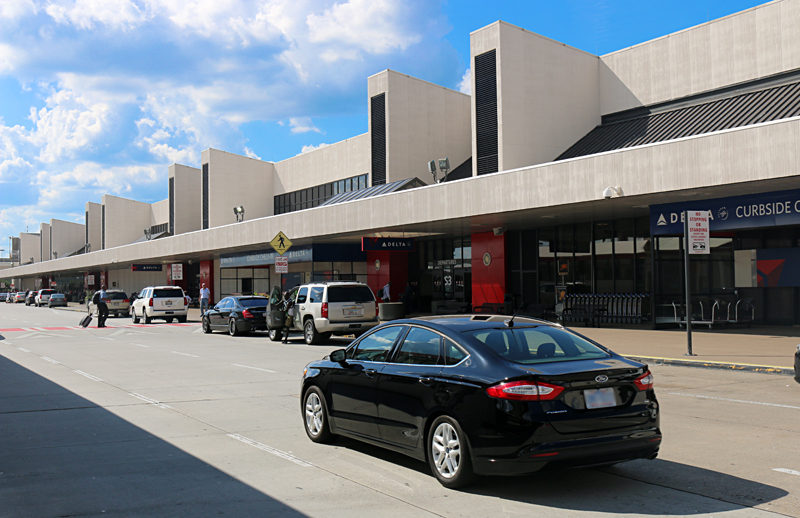 Options do abound if additional airports started charging access fees to motorists — such as the passenger parking his or her own vehicle at or near the airport; buses, trains and other forms of public transportation; taxi cabs; ride-sharing services such as Uber or Lyft as several examples — but not all options are available to everyone everywhere due to a lack of infrastructure or a cost which may be too high. …instead of just another “money grab” at the expense of travelers. There’s a lot in the post to comment on, but I’ll start with the cost estimate for new parking: $250 Million for 5,000 parking spots = $50,000 per parking spot. Does it REALLY cost $50k per parking spot? If so, I’m in the wrong business – I’ll pour the concrete myself for 20 parking spots and will pocket the $1M… . I will help you, Gizmosdad. Just another money grab. How many people will really not drop off/pick up because of the fee? Not many I’d guess – let’s face it it’s usually at least some level of friend or relative before you agree to the airport ride request. So you’re likely going to still feel obliged to honor the request and presumably the requester will fork over the access fee costs. Have you watched the Seinfeld episode where Keith Hernandez asks Jerry Seinfeld for a ride to the airport; or the episode where George Costanza agrees to pick up Jerry Seinfeld at the airport? I guess I was raised in another era… I thought doing things for your family or friends, like picking them up at the airport, was what caring people would be happy to do. What is “intrusive” about doing something for someone else? I’ve given total strangers (who didn’t look like Jack the Ripper since I am female), rides from the airport when their ride didn’t show up.. I took them to their destination and refused money …. that is what I would LIKE to have someone else do for me. Very mercenary world we live in now. As for “fees” to drop somebody off.. well that is just ONE more step to finally getting the public at large to slow down their trips by air. The “nickle & dime” slow bleeding will eventually take its toll. …and I have sadly learned from vast personal experience that not everyone truly appreciates the efforts of a caring person. When Denver’s new airport opened in 1995, ALL inbound traffic had to pay a toll — there was an entry toll booth 2 miles before arriving the terminal; then you paid on the way out. it was taken down in 2000, and free dropoff/pickup access was in place. Like Dallas, it is not a bad idea if the funds pay for the entry roadway and transit access as an alternative. I have no problem paying a toll to help pay for a project, David Marquette; and I agree with you — but once the project has been paid in full, the toll should then be eliminated. In addition to your example of Denver International Airport, another example is the extension of Georgia State Highway 400. Once that extension was paid in full, the toll booths were torn down. Access to the highway extension is now free of charge for all motorists.